I love a good deal … don’t you?! The other day, we spent a good portion of the day over at my brother-in-law’s house. I’m almost convinced that he is the king of good deals after hearing him tell us about all of the stuff he found at various places recently, that was really cheap! He ended up giving the two older boys a bowling bag (something they’re just getting into and loving, so it was a nice surprise). Now that I know where he finds some of his deals, I am keeping my eyes peeled as well. 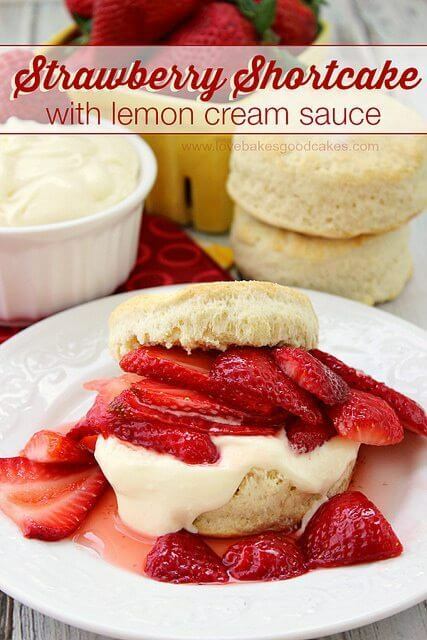 We’ve been using them for snacks, in salads … and one of my favorites – strawberry shortcakes! Instead of the traditional strawberry shortcake, I decided to make them into individual parfait glasses which worked out really well! You can find the same cups I used here. It takes so little time to put these together – and my favorite part?! No baking!! You better believe that now that we’re getting into some pretty hot days here in Phoenix! You’ll need fresh strawberries, sugar, pudding mix, milk and pre-made angel food cake. That’s it! 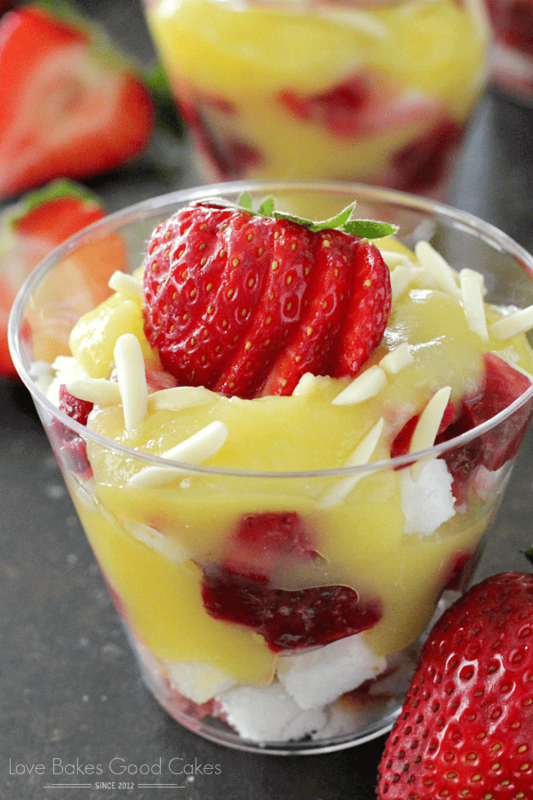 If the little cups aren’t your thing, you can totally make one big trifle instead. Just use the same method of layering the ingredients. I hope you enjoy! 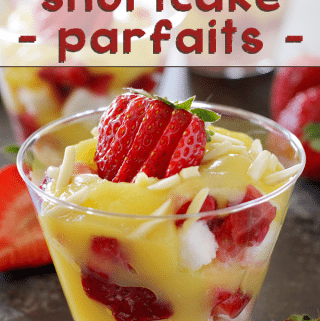 Strawberry Shortcake Parfaits are a summer must-make dessert! No baking and they come together quickly! In a medium bowl, combine the strawberries and sugar until well combined. Cover and chill one hour. In a separate medium bowl, whisk the pudding and milk together until smooth. Cover and chill one hour. 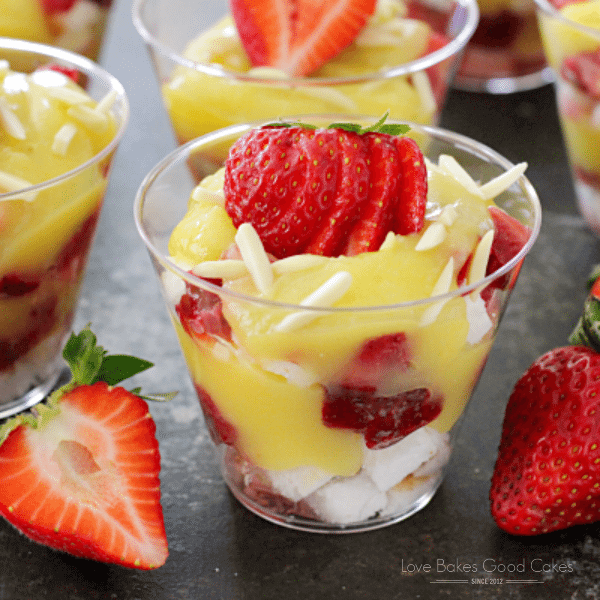 Divide 1 cup of cake cubes between 6 parfait cups. 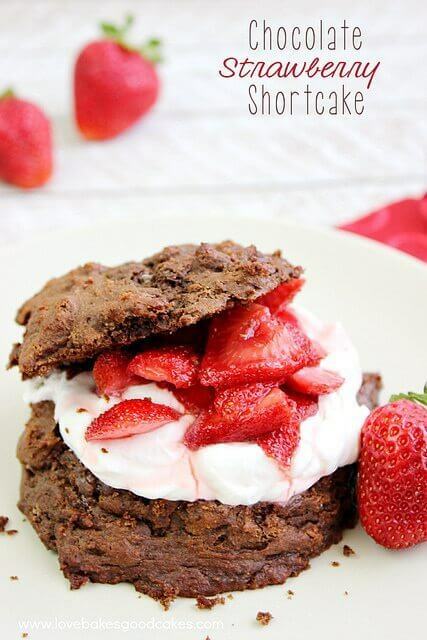 Top each with 1/4 cup of the strawberry mixture. Top with 3-4 tbsp. of pudding. Repeat the layers with the remaining cake cubes, strawberries, and pudding. 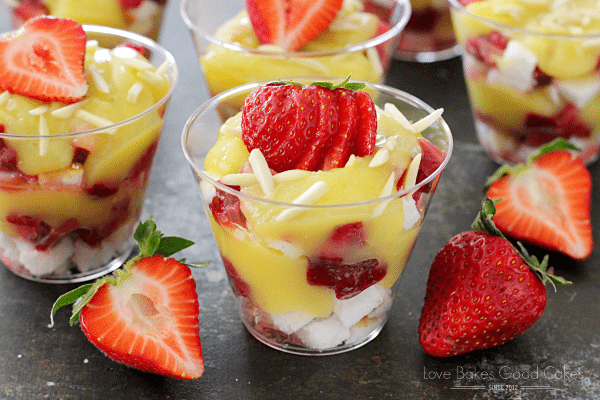 Top each parfait with 1 tsp. almonds. Garnish with a fresh strawberry, if desired. This has my name written all over it! 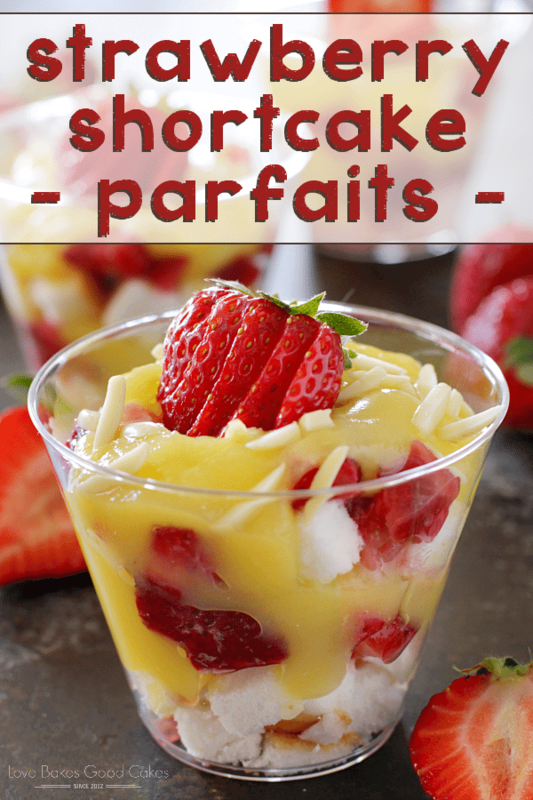 Strawberry shortcake and parfait happen to be some of my favorite words!